“Children’s Day is recognized on various days in many places around the world to honor children globally. In India, Children’s Day also known as Bal Divas, is celebrated across the country to increase awareness towards the rights, care and education of children. It is celebrated on November 14 every year, coinciding with the birth anniversary of the first Prime Minister of India, Jawaharlal Nehru, also called as ‘Chacha Nehru’. Nehru is often cited as saying that children should always be carefully and lovingly nurtured, as they are the future of the nation and the citizens of tomorrow. Bal Diwas was first celebrated in 1964 after the death of Pandit Nehru. Jawaharlal Nehru aimed “to convert India’s economy into that of a modern state and to fit her into the globalized world.” Nehru understood that India had not been at the forefront of the Industrial Revolution, and hence made an effort to promote higher education, and science and technology in India. Inauguration of the first Indian Institute of Technology at Kharagpur in West Bengal, in 1951 was one of the many initiatives that Prime Minister Nehru took towards the spreading of the culture of innovation in the country. As per a report published in the Times of India, on November 14, 2014, when asked about the significance of Bal Divas, 11 year old Shaheen said, “Baal to sabke hote hai, isme mithai kyon baatein? (Everyone has hair; why distribute sweets to celebrate the day?). Like many other kids working on the streets, November 14 was just another day for Shaheen and her friends who work as rag pickers on the Sahastradhara trenching ground. This was true of most kids earning a living who were unaware of the celebrations happening around the country. Busy washing tea cups outside a chai stall on Rajpur Road, Deepu, who lives in a slum close to the Rispana river, drew a blank when asked about Nehru. “Who is he? Is he one of our customers,” he whispered, even as his employer hollered at him to carry on with the dishes. School students are invited to submit their essays focusing on themes relating to innovation, technology, science, education, etc. before the deadline of November 12, 2017. 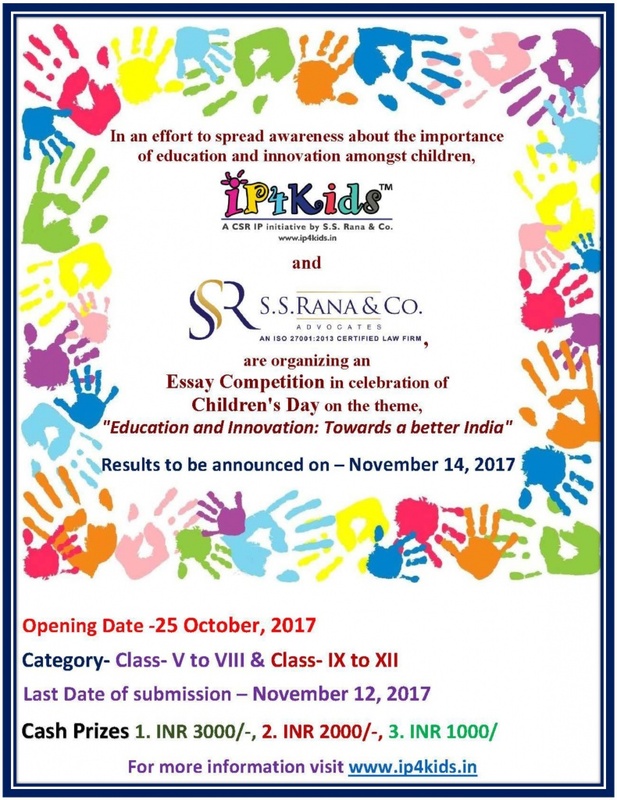 Qualified Experts and Judges appointed by IP4kids and S.S. Rana & Co. will select the best 3 essays. Following this, the winners will be announced in IP©onnect, S. S. Rana & Co. weekly newsletter on November 15, 2017. All entries are to be sent only in MS Word (.doc or .docx) or .pdf format. The winner will be awarded cash prize worth INR 3,000 along with a certificate. For further information, please write to us at info@vidyadarshan.in or call us at 91-11-3056 2000.